Paraules clau: Diego Laínez, Enrique García Hernán, Francesc de Borja. Inclou un article d’Enrique GARCÍA HERNÁN sobre “Diego Laínez y Francisco de Borja: éxitos y fracasos de una relación difícil”, p. 313-350. Diego Laínez (1512-1565) came from a Castilian family of Jewish origins. His studies at the renowned universities of Alcalá de Henares and Paris prepared him for an outstanding academic career. In 1533 he joined Ignatius of Loyola and became one of the first Jesuits. He was valued for his intellectual gifts both within and outside the Society of Jesus. Right after his arrival in Rome at the end of 1537 Pope Paul III commissioned him to teach at the Roman La Sapienza University. An acknowledged expert on Reformation and Catholic doctrines, he participated in all three periods of the Council of Trent as well as in the Colloquy at Poissy. He was also a popular preacher. Autocratic rulers and the councils of Italian city states sought his help in church reform and the foundation of Jesuit residences. During his generalate Ignatius increasingly sought his counsel and prepared him as his successor. 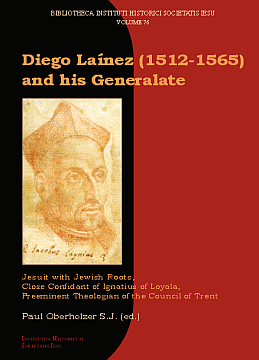 No Jesuit stood closer to Ignatius than Diego Laínez. His influence can be found in elements of Ignatius’s way of governance. Thus the generalate of Laínez can be seen as a development of Ignatian intentions. Laínez published nothing during his lifetime. Many sermon manuscripts and letters lie unread in the Archives of the Society of Jesus in Rome. The task of this book is to assemble current knowledge and scholarship about Diego Laínez and to encourage new and deeper studies of his life and his generalate.